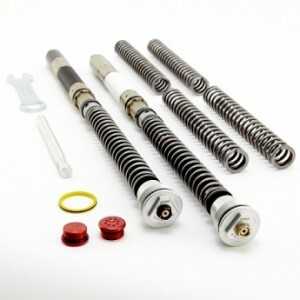 Closed Design/31mm Control Pistons; 20mm Displacement Pistons; 8mm Rod/Includes 3 Sets Of Springs & Spring Change Tools. For superior performance, this product should be installed and maintained by an authorized K-Tech Suspension service center. Specific tools are required for installation of this kit. 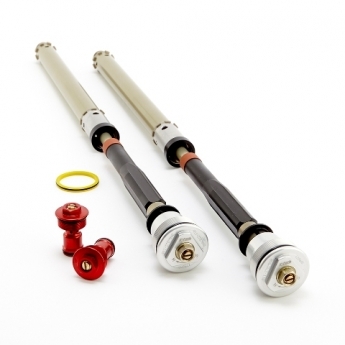 K-Tech 25SSK carts $1,344.27 The 25SSK front fork cartridges have been designed to fit original equipment front forks for track and racing use. These high quality replacement cartridges are designed and manufactured in the UK using the highest quality materials and processes giving optimum performance and confidence to the rider. The open cartridge damping system uses 25mm diameter control pistons with a 14mm diameter aluminum piston rod giving a big displacement of fluid for accurate damping control. All of the aluminum parts are hard anodized to protect against wear and contamination of the damping oil during use giving longer intervals for servicing. Fork springs are NOT INCLUDED, but available separately. For superior performance, this product should be installed and maintained by an authorized K-Tech Suspension service center. Specific tools are required for proper installation of this kit. 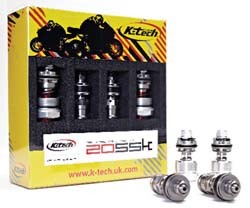 K-Tech 20SSK Piston Kit $325.82 Designed 100% in house at K-Tech UK. Designed for use in OEM front fork systems, all parts are CNC machined using the finest materials to exacting tolerances. Kits provided enhanced damping efficiency over the standard systems for better feel and control. An excellent upgrade for street or track use! For superior performance, this product should be installed and maintained by an authorized K-Tech Suspension service center. 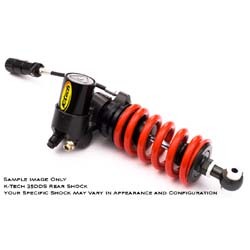 K-Tech 35DDS Pro Shock w/ BPV $1691.50 The 35DDS Pro features a CNC machined billet aluminum body and internals, with independent circuits for rebound and compression damping. Each circuit has 32 clicks of adjustment for precise suspension tuning and damping control under any street, track day, or racing conditions. The aluminum body and internals of the 35DDS Pro are hard anodized for great looks and wear resistance. Additionally the 35DDS Pro rear shock offers length adjustment for easy geometry changes, and includes a hydraulic spring preload adjuster for easy sag adjustments. Also included is the K-Tech developed By Pass Valve, adjustment circuit is included to provide precise fluid control under the most demanding conditions (16 clicks of adjustment). 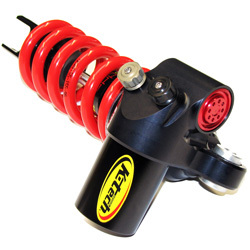 The By Pass Valve (BPV) is an additional unique external adjuster found only on the 35DDS Pro Series rear shock absorber. The BPV adjuster allows oil to flow freely between the two circuits (compression and rebound) at very low velocities. The BPV adjustment feature is not found on any other brand rear shock, and is highly regarded by riders and tuners who have experienced its benefits. This feature would otherwise require additional custom valving (that might approximate the results) and tuning on top of the base cost on competing brands. K-Tech 35DDS Lite Shock $1295 The new 35DDS Lite features the same CNC machined billet aluminum body and internals, with independent circuits for rebound and compression damping, as the 35DDS Pro. Each circuit has 32 clicks of adjustment for precise suspension tuning and damping control under any street, track day, or racing conditions. The aluminum body and internals of the 35DDS Lite are hard anodized for great looks and wear resistance. Additionally the 35DDS Lite rear shock offers length adjustment for easy geometry changes, and a manual spring preload collar for adjusting sag. The 35DDS Lite can be upgraded to Pro specifications at any time by adding the hydraulic preload adjuster, or the bypass valve adjustment circuit.